There's no way around it: typing on a touch screen is horrible. That's why so-called "autocorrect fails" are so widespread -- it's really, really easy to say the wrong thing when your fingers are fumbling around on a screen. 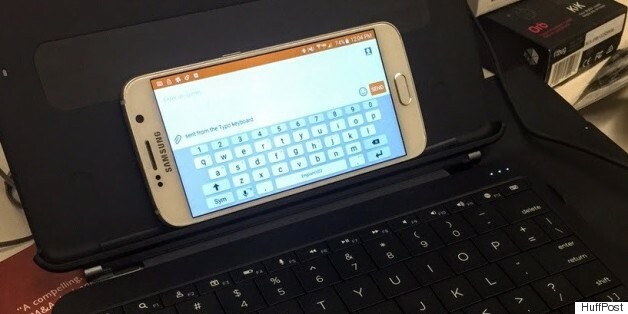 Thus, there's a booming market for keyboard apps and physical peripherals that make it easier to type on smartphones and tablets. The latest to make headlines is the Typo, a joint venture between CEO Laurence Hallier, COO Jonathan Goodrich and media star Ryan Seacrest. The company got some tough news Tuesday when a settlement was announced with BlackBerry that would prevent Typo from manufacturing physical keyboards for mobile devices with screens smaller than 7.9 inches. But that's not stopping Typo from moving forward with an array of products for Apple's iPad tablet. "When Ryan and I started this company, we really wanted to make products for ourselves and people like us. People who live on their phones and tablets and who rely on them to run our businesses and our lives. In that regard, nothing has changed," Hallier told The Huffington Post in an email interview. The company announced Wednesday that its new keyboards for the iPad Air and iPad Air 2 are now available to order. Hallier told HuffPost that models for the iPad Mini 2 and iPad Mini 3 will be available in the next month or so -- and that "a couple very innovative 'non-keyboard' products" are coming, too. It's nowhere near a perfect fit (it's not supposed to be), but the Typo keyboard works with phones. The new Typo is comfortable and sturdy. It doesn't wobble around when you have it on your lap, and the kickstand has no problem supporting the full weight of the iPad. Because it's meant to be portable, you might find that the keys feel a bit "flat" or close together, but that's the trade-off you make with any mobile-friendly keyboard. We found that typing speeds on the Typo keyboard versus a full computer keyboard were roughly cut in half, though they would likely increase once you become comfortable with the device. The unit costs $189, which may seem a bit steep, but the kickstand and case essentially transforms your iPad Air into something closer to a little laptop. It's still briefcase-friendly. Hallier's confident it'll take off. "I believe if we continue to deliver this type of product and experience to our customers, Typo will have a very bright future," Hallier said.